The brand spankin’ new Venum Kontact Gel Hand Wraps are here! Wear these Venum Kontact Gel Hand Wraps under bag gloves and training gloves as a better alternative to ordinary handwraps, or wear them alone for bag work, mitts, speed bag and more. 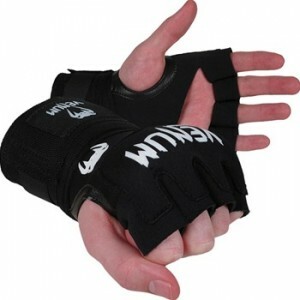 The gel shock protector provides for great cushioning action and support for knuckles and wrist. The neoprene construction also offers great grip. With a quality that only Venum can provide, you can’t go wrong with the Venum Kontact Gel Hand Wraps. The Venum Kontact Gel Hand Wraps are available at MMAWarehouse for $15.99.